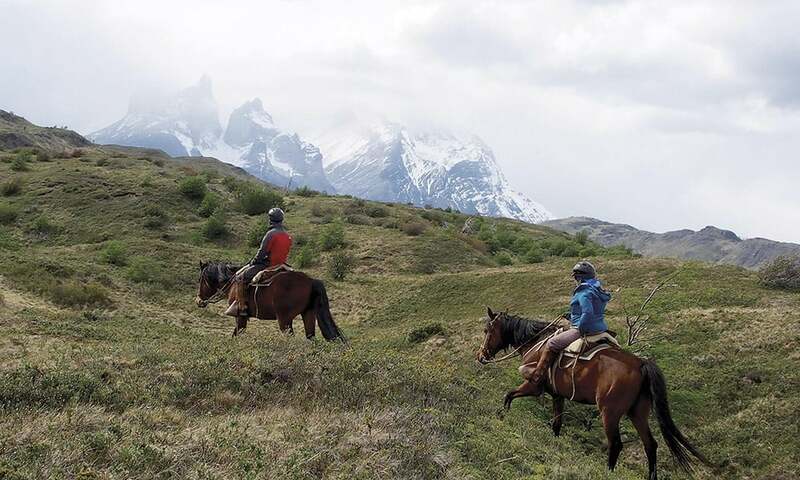 A guided horseback tour in Patagonia's stunning Torres Del Paine National Park. The Paine Massif mountain range presents the three jagged peaks of Torres del Paine as a breathtaking backdrop. Photo courtesy of Explora. Located in southern Chile, Torres del Paine National Park is so stunning that it has often been touted as “the eighth wonder of the world.” The park’s most recognizable feature is the mountain range known as Paine Massif. The picture-postcard view and most breathtaking features are the three jagged granite peaks of Torres (towers) del Paine joined by the Cuernos (horns) del Paine. The park’s other natural gems include ancient forests and prominent water attributes like fjords, lakes, glaciers, waterfalls, lagoons, and rivers. There’s nothing like seeing condors taking flight and swirling in the thermals with the “Towers” in the background or watching a herd of goofy guanacos (think ‘mini-me’ versions of llamas) roaming the pampas. Discovering these unique features of the park astride a sturdy Patagonian horse ranks high on many visitors’ to-do list. Gauchos, the Patagonian cowboys, have been riding the pampas range for centuries, their ranching culture offering an authentic view into living with the land. 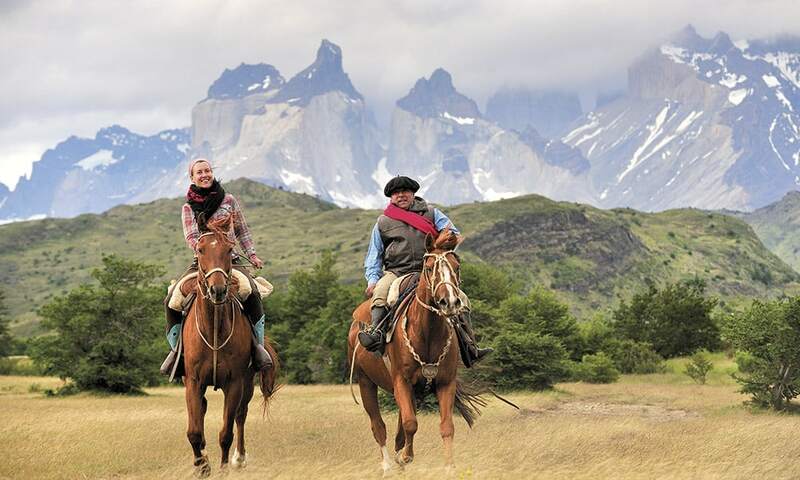 Explora Patagonia Hotel Salta Chico works with gauchos in their one-of-a-kind horse program, offering guests a way to participate in this special way of life on the pampas. An Explora guest and Patagonian guide enjoy a trot in the flowing grasses against the massive triple-peak backdrop. Following a narrow path, our small pack of saddle horses amble up and over rolling hillsides accompanied by persistent gusts of wind. “The wind always moves, if it stops then something has happened,” says one of the guides as we walk the horses on a forested path lined with native lenga trees (similar to birch trees) that provide a bit of a wind block. Patagonia is a landscape shaped and defined by the wind. It’s not uncommon for the wind to reach a speed of 75 mph or more during the summer months (November – March). Weather conditions can change suddenly. This is sharply apparent as we move across the seemingly endless landscape on horseback. Glad to have remembered a fleece neck gaiter, I pull it up towards my nose to guard my face and ears from a coarse gust. You have to be willing to bear the elements of this southernmost tip of the South American continent when exploring the diverse terrain. Packing versatile layers and gear helps one to cope with the weather elements of the unique land mass. 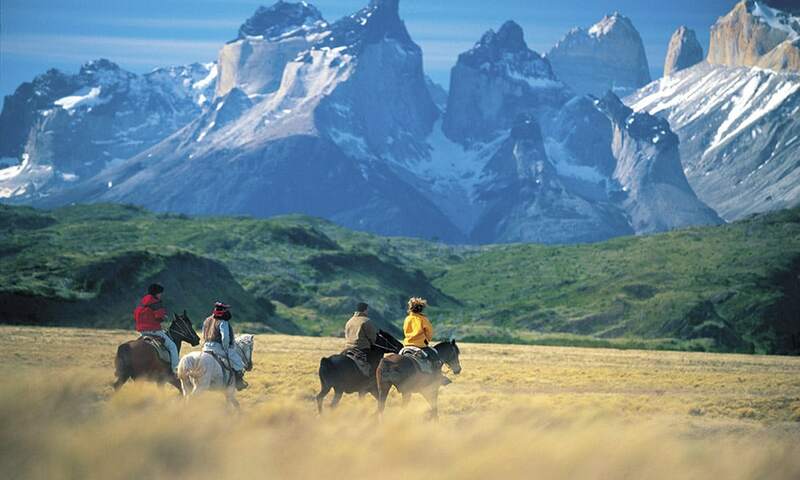 With the region being situated between the Andes Mountains, the Southern Patagonian Ice Field, and the vast Patagonian Steppe, you could easily experience “four seasons in one day.” For the horseback rider seeking fenceless open spaces, adventure, and monumental natural beauty, it’s a thrill of a lifetime. I glance over at the two gauchos and two guides leading our group of eight riders through the pampas grass. Before us is the fast-flowing Paine River. The gauchos splash ahead, water reaching their stirrups. Their horses step slowly and carefully forward, remaining calm. A few riders in our group look distressed at the prospect of crossing the river, though none of the horses balk. The Patagonian wind doesn’t help much as it pushes against our bodies, blowing wisps of hair across my face. One woman riding next to me, who had never crossed a river on horseback, is frightened. The guides quickly assure her she would be fine, letting her know that the horses are trained for river crossings and every element of the trail. Our horses, agile and confident, reach the opposite shoreline non-plussed: It’s just another day in the office for them. Bolstered by completing the crossing, the woman is no longer frightened, but smiling as if she’s just won Olympic Gold, trotting onto the trail with the Paine Massif in view. The horseback ride amidst the wind and rain along the pampas and overlooking peaks with multiple river crossings was my first experience with an Explora Patagonia-trained horse. And I loved it. Writer Gigi Ragland ascends the foothills of the majestic Paine Massif. As much as I loved being outside on horseback, the inside of the hotel property offers luxurious yet comfortable leisure in the most understated way. The recommended stay is 3-5 nights so that you can enjoy as much of the outdoor explorations as possible, including hiking and horseback riding. The rates are all-inclusive, with delicious meals prepared using local ingredients (not easy to do in a remote National Park setting). Afternoon meals are often accompanied by fine Chilean wines. You can enjoy cocktail hour with your drink of choice; a Pisco Sour perhaps? Guides chat with guests and discuss options for the next day, after which you could head down to the spa for a massage, swim in the heated pool or soak in the lake-facing hot tubs. My favorite aspect: wall-to-wall, floor-to-ceiling windows overlooking Torres del Paine in the main section of the hotel, as well as the guest rooms. Truly hypnotizing. It takes effort to walk away from the view, even if you are preparing to ride within the park. 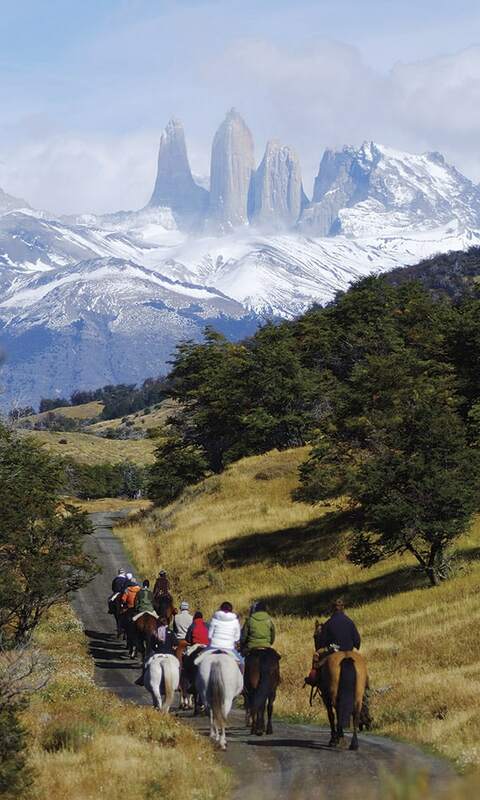 The dominating peaks of Torres del Paine offer an awe inspiring visual for riders in the park. From the stables we head out on a bluebird afternoon with the spring sun shining on our backs. Calafate shrubs beginning to yield yellow blooms blanket a slight rise and distract me as we round a bend. I look up, and there, like a rabbit drawn from the magician’s hat, springs forth the Towers embraced by a ring of white clouds. I gasp at the raw beauty before me. Pulling back on the reins for my horse to stop, I just stare, finding it hard to draw my eyes away. In these few minutes, I took in the views that would last a lifetime in my memory. October through April, although horseback riding is offered year-round. Lead guide Tim Connelly suggests visiting in the off-season when there are fewer people in the park. Visit Explora.com to learn more about Explora Patagonia Hotel Salta Chico and other South American horseback adventures.